Why Is a Window Latch Important? You are here: Home » » For the Buyer » Why Is a Window Latch Important? Can you fully close your windows? Does it matter if you cannot? When looking at homes small things can make a big difference. I guess that I have the small details stuck in my head at the moment. I have written a few posts detailing the significance of the small. If you are buying a home, or if you are living in your home, the small escapes our attention. I walk through homes with my clients after a home inspection, and they did not realize that a door does not work. We focus on other elements, so we do not open and close each door. By the same token, we do not look at windows. Particularly in new homes, we assume that windows work. Right? Wouldn’t the builder check after installation? Believe or not, they do not always check. Making sure a window works once fully installed seems a simple step, yet it is overlooked by some. I inspected a new house where maybe half the windows did not latch shut. When we buy a window, the latch is already attached. We have to ensure that we installed the window properly, and everything should work. However, the latches are not always pre-installed. A contractor has to goto each window to install the two components that make up the latch. If he is rushing through the job, then he may not set them in the correct positions. He never checks to see that they latch. This does not seem to be a big detail, and maybe you as the buyer appreciate that the home inspector discovered this discrepancy, but you were not concerned. If a robber is trying to break into the house, there are other ways of preventing him. The window latch does more than secure the window though. I really want to laugh at times. We do not want to pay high energy bills, so we go on the hunt to find ways to be more energy efficient. Then we fail in other ways. My favorite is leaving the flue open in the chimney. All that conditioned air going right out of the house. 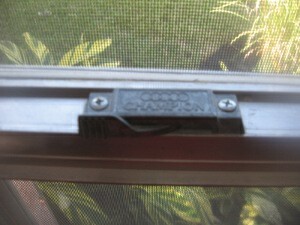 When we close a window, we have not sealed it until the latch is engaged. By moving the lever to latch the window, we push the frame down slightly to make a tight seal. This seal serves two purposes. One is the energy efficiency angle that I just mentioned. The latch makes the home air tight, so that conditioned air does not escape, or that conditioned air will be effected by the exterior air at a different temperature. The second purpose has to do with moisture. Rain that lands at the base of the window can seep into the home. If enough moisture comes in over time, you can have damage to the frame or trim around the window. You can buy new latches. They sell them at hardware stores or buiding supply centers. They are easy to install. Two screws for each section go into the proper frame for two component latches, and two screws only forone component latches. You have to be sure to line them up. I mention this, because I do find a good deal of broken latches in older homes. My home has a window with a broken latch right now. I am planning to put a new one in this weekend.The window latch may be a bit of security, but this small detail is so much more vital for the home. This entry was posted on Wednesday, October 20th, 2010 at 11:51 am	and is filed under For the Buyer. You can follow any responses to this entry through the RSS 2.0 feed.